As far as non meal items go, there are only two things that I know, for a fact, my grandmother enjoys: peanut butter and biscotti. That's it, peanut butter and biscotti (no complaints here). So when I wanted to bake something for her birthday celebration, I did what needed to be done. Typically when I'm going about a recipe I checkout what others have done before me. Even if I don't intend to follow the recipe, I just like to know what's out there. In this case every recipe I found seemed to risk diluting the peanut butter flavour by adding butter to the recipe. Essentially, these were American-style biscotti with peanut butter. 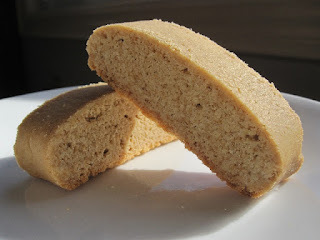 I knew that a more Italian-style biscotti, with its minimal ingredients, would highlight the peanut butter flavour more and went about adapting my Italian-Style Vanilla Biscotti. It's a little unusual for me to double a recipe, but my biscotti recipes don't make a whole lot of cookies, and I was going to need a few more to satisfy my family (hopefully). As usual, I would be using regular Kraft Peanut Butter (I hear there might be other kinds) and to compensate for the added sugar and salt reduced both in the recipe. Other than that I simply added a full cup of peanut butter. Flour, Sugar, Eggs and Peanut butter. Doesn't that just scream awesome? My only concern was really the handling of the dough. Biscotti dough is notorious for being sticky, but this had to have been the easiest biscotti/cookie dough I have ever worked with. It didn't stick to anything and was very easily manipulated. During the entire process the most trouble I had was deciding on what size biscotti to cut. Although if you make the full recipe, it will give your mixer a workout. The biscotti turned out absolutely, positively, categorically (conclusively?) FANTASTIC! This is one of those rare occasions where I can say, in all truth, that I wouldn't change a thing. Nothing. Yes, they were that good. My brother probably put it best, describing them as "so obviously peanut butter, but not overly peanut butter." In my opinion this is the true mark of great biscotti. Biscotti should always be mild in flavour and these epitomized that. Lightly sweet with a wonderfully light peanut butter flavour. The biscotti retained a nice crispy and crunchy texture but not of the tooth shattering (true Italian) variety. I had anticipated this as a result of the peanut butter, and to be sure it was a small compromise for such terrific flavour. I can't recommend this recipe enough. It's incredibly good and will please peanut butter and biscotti lovers alike. Everyone enjoyed them, my grandmother included, which made me quite happy. She did give me one "negative" comment: Too neat. Apparently it looked like they had come out of a package :). Her recommendation was to score them with a fork before baking; yah know? Mess 'em up :). It's the first time anyone has ever accused me of baking something that looked too good. Most of the time I'd settle for "moderately-inoffensive." Preheat oven to 300F and line a large cookie sheet with parchment paper. In a large bowl add flour, baking powder, baking soda, salt and whisk to combine. In the large bowl of a mixer add sugar and eggs and beat until pale and frothy (2 minutes). Add peanut butter and continue to beat until completely combined (1 minute). Reduce mixer to low and gradually add dry ingredients to wet, mixing until combined and scraping down the bowl as necessary. Gather dough and turn out onto a lightly floured surface, kneading until the dough can be brought into a solid ball. Place half the dough on prepared cookie sheet and shape into a long rectangle about 15” x 2 1/4” in size, keeping the thickness as even as possible. Bake both halves for 45 to 55 minutes or until edges start to brown (this took me about 49 minutes). Remove from oven and allow to cool on cookie sheet for 2 minutes. Place cookie logs on rack to cool for 5 minutes. With a sharp serrated knife, cut cookies approximately 3/4" inch apart (on a bias if you choose). Set each cookie upright on cookie sheet with as much room between as possible (try not to crowd them too much). Remove from oven and allow to cool on cookie sheet for 1 minute before moving biscotti to rack to cool completely. I loved this post! What an honor for your grandmother 'the beast' to compliment your cookies! It's a wonder that peanut butter and biscotti haven't been combined before, since crispy crunchy and peanut butter flavor goes together so well. But I've never seen a pb biscotti before, perhaps because it's not considered 'traditional.' I love the fact that she is old skool 'Eye-Talian' as a baker yet still loves peanut butter. It makes me feel validated in my 'nutty' obsessions. Yeah, my Grandmother defines old school and in the best ways possible (although she doesn't own one pair of flat shoes *oy*), I was really excited that she enjoyed them, and then followed up with a question about how I made them, and how she could incorporated PB into another of her recipes (mind=blown). 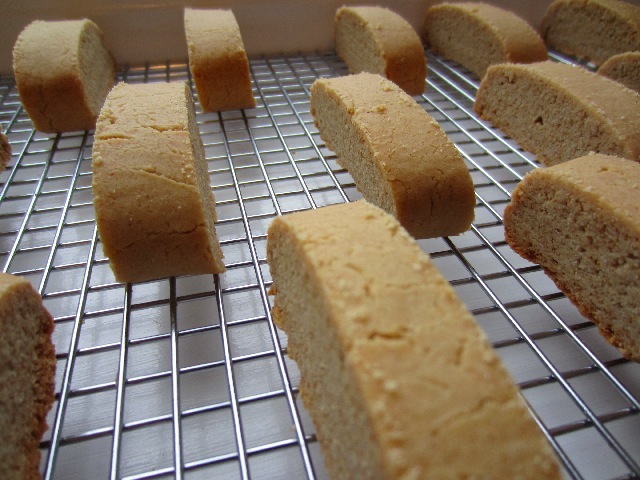 These biscotti are just too perfect!